Do you want to know how many times your subscribers download your lead magnets? One of the best ways to build a bigger email list is to offer site visitors a file download in exchange for their contact information. By learning how to track WPForms file downloads, you can see which lead magnets site visitors like most. In this article, we’ll show you how to track WPForms file downloads to improve lead magnets and your email marketing efforts. Why Track WPForms File Downloads? 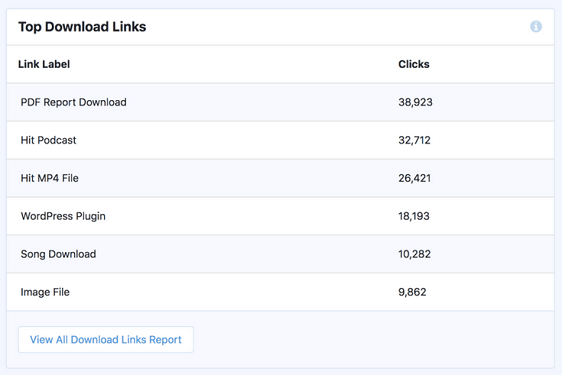 If you’re offering site visitors different kinds of file downloads in exchange for their email addresses, it’s a good idea to track those file downloads to see which ones are being downloaded the most. Need some lead magnet ideas? Check out this roundup of popular content upgrades that can be used as lead magnets to encourage people to sign up for your email list. The thing is, you’ll never know which lead magnets are working the best if you only use Google Analytics. That’s because Google Analytics doesn’t support file downloads tracking, so your WPForms file downloads won’t be recorded. That said, if you use MonsterInsights, the best Google Analytics plugin on the market today, you can not only track your WordPress form conversions, but your WPForms file downloads too. So, before we show you how to track WPForms file downloads, make sure to check out our step by step tutorial on how to deliver a content upgrade to form subscribers so you can create some lead magnets for your site visitors. After you have your lead magnet subscribe forms created on your WordPress website, you’ll need to set up Google Analytics in WordPress using MonsterInsights. 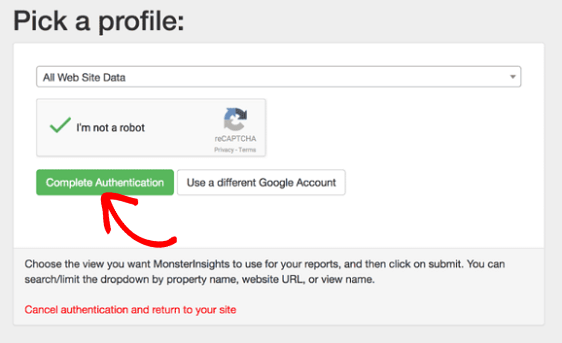 To start, you’ll need to install and activate the MonsterInsights plugin. 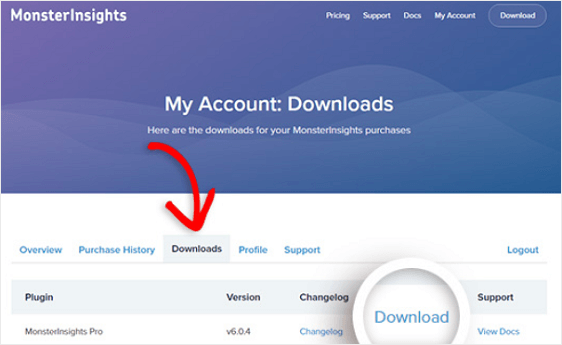 After purchasing the MonsterInsights Pro plugin, log into your MonsterInsights account by clicking on the Login link at the top of the page. Next, go to the Downloads tab on your account page. You’ll see a link where you can download the MonsterInsights Pro plugin. Before moving on to the next step, make sure you deactivate and remove any other Google Analytics plugin or tracking code you have on your website. Now that you’ve downloaded the plugin, go to your WordPress dashboard to install and activate the plugin on your site. Go to Plugins » Add New and click on Upload Plugin, found near the top of the screen. On the next screen, select Choose File to select the zip file you just downloaded from your MonsterInsights account. Click Install Now to upload the file and install it on your website. Once uploaded, click Activate Plugin to activate it on your site. 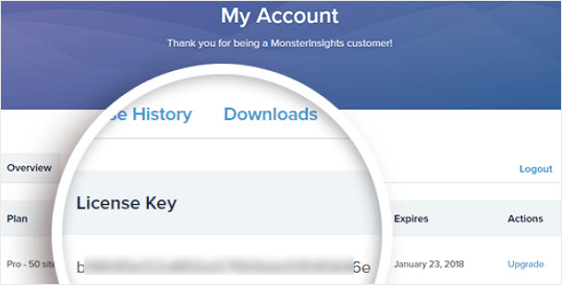 Lastly, go to your My Account page in your MonsterInsights account to get your license key. 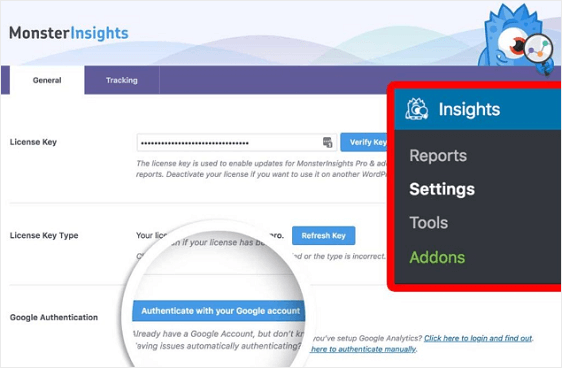 Copy your license key and go to Insights » Settings in your WordPress dashboard. Click on Verify Key, paste your license key, and click Activate Key. 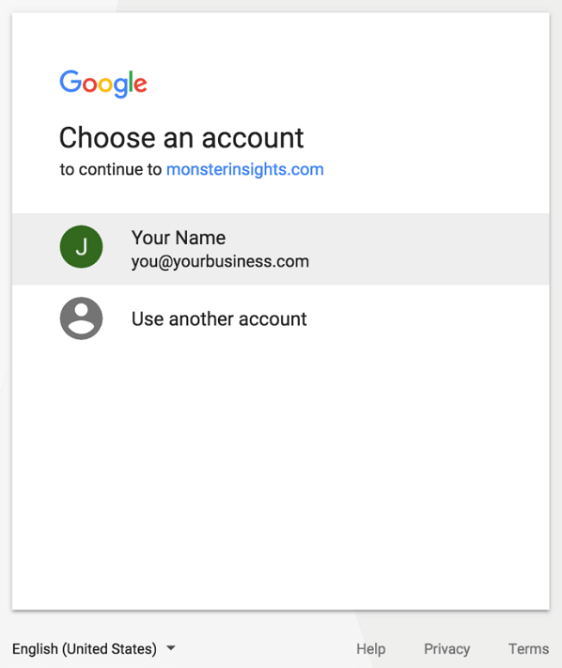 To use MonsterInsights, you’ll need to connect your WordPress website to your Google Analytics account. Luckily, this is very easy to do and requires no coding. Before you start, make sure you have a Google Analytics account. Check out Google’s guide on setting up a property. Next, go to Insights » Settings in your WordPress dashboard. Click on the Authenticate with your Google account button. On the next screen, select your profile. When prompted, click the Allow button to give MonsterInsights access to your Google Analytics data. Next, select the website profile you want to authenticate and click Complete Authentication. Now your WordPress website is connected to your Google Analytics account and file tracking is automatically enabled. 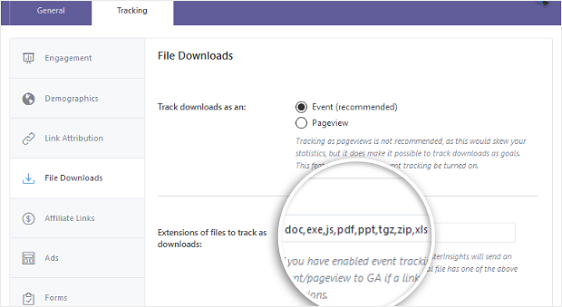 Even though file tracking is automatically enabled on your WordPress site once MonsterInsights is set up and connected to your Google Analytcis account, you can decide whether to track WPForms file downloads as events or pageviews. By default, MonsterInsights will track file downloads as events. 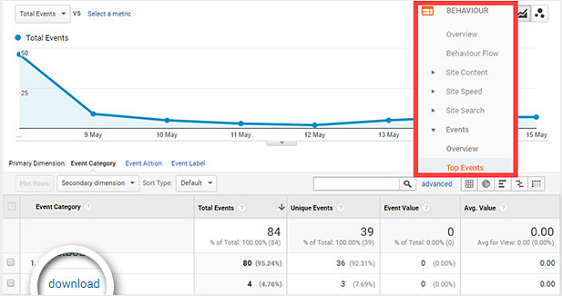 In Google Analytics, events are used to measure the interactions of your site visitors on your website. For instance, downloads, mobile ad clicks, and video plays can be tracked as events in Google Analytics. However, you have the option to track your form’s downloads as pageviews if you want, though it’s not recommended because it can skew traffic statistics. 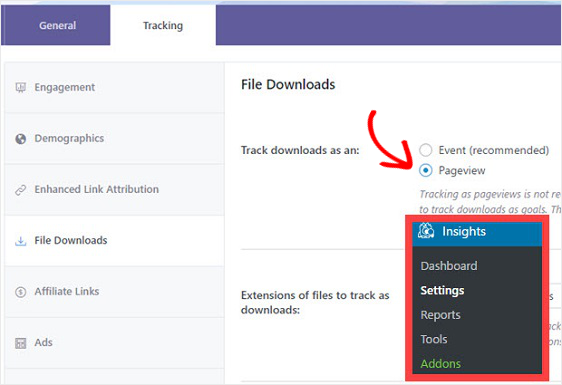 If you still want to track a file download as a pageview, go into Insights » Settings » Tracking. Select pageview and click Save. MonsterInsights will let you track WPForms file downloads of the following file extensions: doc, exe, js, pdf, ppt, tgz, zip, and xls. If your lead magnet is in any file format other than the defaults, all you need to do is enter the file format you want to add, separated by a comma. Now, anytime someone downloads a file on your WordPress forms, both MonsterInsights and Google Analytics will track it. Once people start subscribing to your email list, and downloading your different lead magnets, it’s time to check out which ones are being downloaded the most. To do this in WordPress, go to Insights » Report » Publishers Report. Remember, MonsterInsights works with Google Analytics to track WPForms file downloads. To view downloads in Google Analytics as pageviews, go to Behavior » Site Content » All Pages. 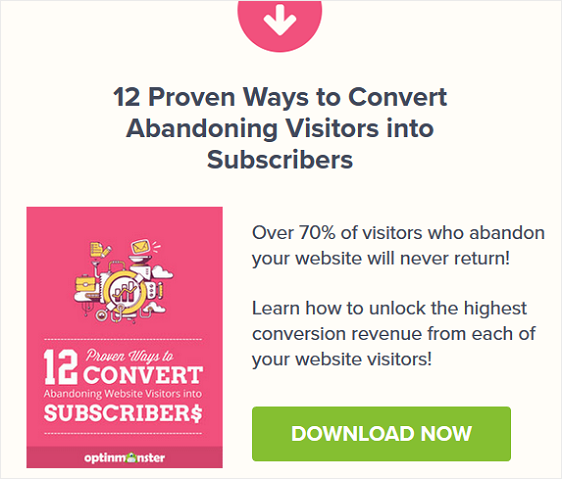 Find the pages that you redirect people to once they subscribe to your email list and check out how many pageviews each has to see which lead magnets are the most popular. To get the most detailed look at what is happening with your downloads, click on Top Events. You’ll then see how many times each type of file download you offer on your website has been downloaded by site visitors. And there you have it! You now know how to track WPForms file downloads so you can improve your lead magnets and give site visitors more of what they want. Once you find yourself building up a sizeable email list, be sure to check out these top email marketing metrics that matter most to your success so you can keep your email marketing momentum going. And if you’re interested in placing popups on your website, complete with lead magnets to get people to subscribe, check out this tutorial on how to create a contact form popup in WordPress.